The bearish gap below consolidation is a pattern that often signals a massive sell off in a stock. Investors should avoid these stocks and traders can short these stocks. While this type of gap does not happen often, when it happens to your stock, you should really pay attention to it. A consolidation is where the stock trades sideways for a period of time. For example, the stock may trade between $45 and $50 for 3 months. Eventually the stock will either breakout or breakdown of the consolidation. A breakout will be bullish while a break below the consolidation will be bearish. When a stock gaps down below the consolidation, that is double bearish. 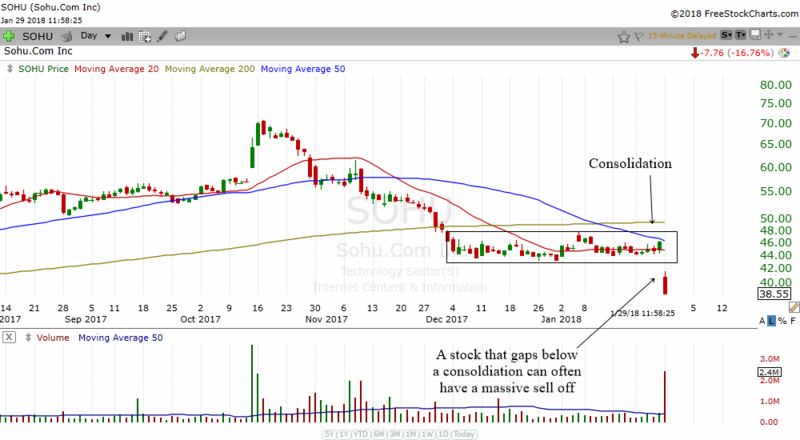 The chart above shows SOHU consolidating for almost two months. Then it gap down below the consolidation. You can see how the stock already had a sell off during the day. Sometimes the stock may bounce up but most of the time it will continue to go lower. Trivago is an extreme example of bearish gap below consolidation. 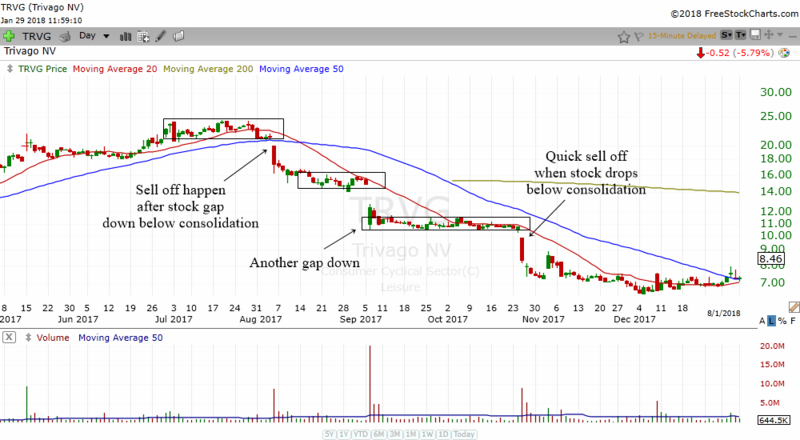 In the daily chart of TRVG above, you can see 3 gap below consolidations. The first gap below consolidation send the stock going lower immediately. While the second gap down did not have a sell off, nevertheless, investors still lost a lot of money on TRVG. The 3rd gap below consolidation behaved like the 1st one. It send the stock lower quite fast. I have found that this pattern also works very well in other time frames as well. The chart above is the 15 min chart of Apple. 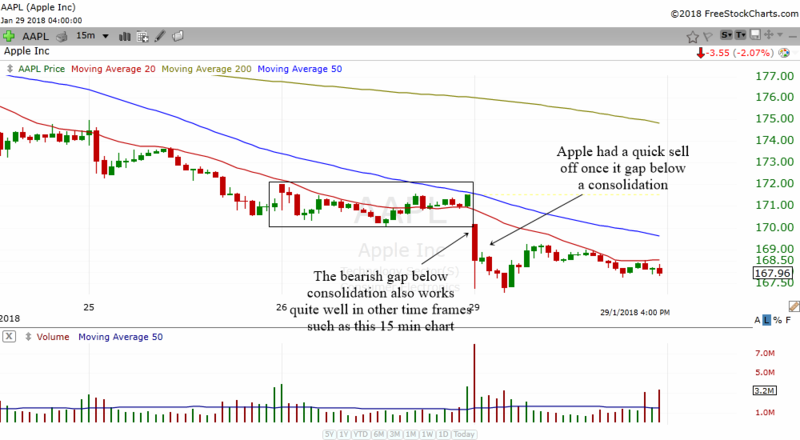 Apple had a very bearish start to the day by gapping below a 15 min consolidation. It immediately had a quick sell off. Gaps can be very powerful. A gap down is very bearish for the stock. If your stock gaps down below a consolidation, it can be very hard for it to rise again. The consolidation will act as a resistance even if the stock manages to rise back to that area. Therefore, be very careful when your stock experiences a gap down below consolidation. It is wise to consider selling your shares.